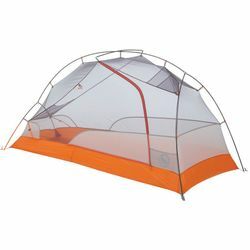 Big Agnes Copper Spur HV UL1 Bikepack Tent. From the award-winning, best-selling line of Copper Spur HV UL tents comes a bikepacking tent designed for on and off-road, two-wheeled travel. The pole segments have been shortened for optimal handlebar, pannier, and saddlebag storage. The burly compression stuff sack with a daisy chain makes storing these tents anywhere, a cinch. Enjoy the comforts of extras like an oversized storage pocket, webbing for dry helmet storage, and all the other features that make two-door Copper Spur HV UL tents the bomb. Singletrack, two-track, and roadie riders rejoice! The two-door Copper Spur Bikepack tents are perfectly equipped for packing on all two-wheeled, overnight adventures. Unless otherwise noted, all published weights in our catalog and website are �trail weights�; the weight of the tent components necessary for setup and function. Packed weight is the weight with everything included with purchase. Extra protection for your tent floor or a lighter weight FastFly setup. Your choice!